Recently, the popular cryptocurrency Ripple went berserk, surging to newer heights. So much so that people all over the world wanted to buy it and book profits. For those of you who don’t know what Ripple is, it is a cryptocurrency famously dubbed as the currency for banks. However, as most of you know, cryptocurrencies and banks don’t go hand in hand, which is why this currency was snubbed by most well-informed people. That said, there is no denying the fact that investors made humongous profits from Ripple last year. Ripple (XRP) currently has the third highest market capital in the cryptocurrency world. In the past month alone, the prices have gone from $ 0.25 to $ 2.10 and look like it will surge further this year. Because of this hyper rally, Ripple has yet again caught the attention of many investors around the world who are still seeking to invest in it. If you have BTC already, you can use any of the following methods to convert them into XRP. There are several ways of exchanging and buying XRP for BTC, but for this write-up, I will only list the ways which we have personally used and are confident about. Changelly is popular cryptocurrency swapping exchange which provides you fast access to different cryptocurrencies in exchange for BTC. The best thing – there is no need for a KYC or other lengthy form registrations to use Changelly. However, Changelly requires you to sign up with an email ID, but you can use an alias if you don’t want to reveal your identity. I personally use Changelly for their competitive exchange rates and viewable transaction history for tracking. Some Bitcoins to exchange for Ripple. Head towards CoinSutra’s Cryptocurrency Exchange – Changelly and follow the steps given in this guide. Note: This guide shows how to buy Ripple in exchange for BTC in a step by step manner, so you need not worry about anything. Binance is my favorite cryptocurrency exchange and the more I say about it, the lesser it feels because of its fabulous service to crypto-space. Binance started from China and concluded its ICO in mid-2017. Since then, it has grown exponentially and is now placed as the numero uno cryptocurrency exchange. It has more than 140 altcoins listed on it which are only increasing. You can also get Ripple from Binance exchange if you have BTC already. 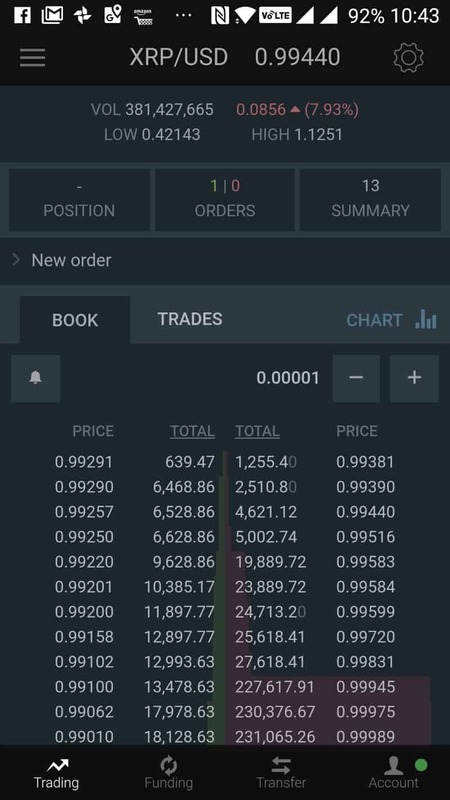 Binance also has a mobile app for the people who want to exchange XRP for BTC on the go. Here is a short video walking you through the mobile app’s UI. You need to transfer BTC and then exchange it for XRP. The process is the same as shown in the video above. Huobi Pro – a leading global digital asset exchange, is a brand of Huobi Global. Huobi Global is a world-leading cryptocurrency financial services group. 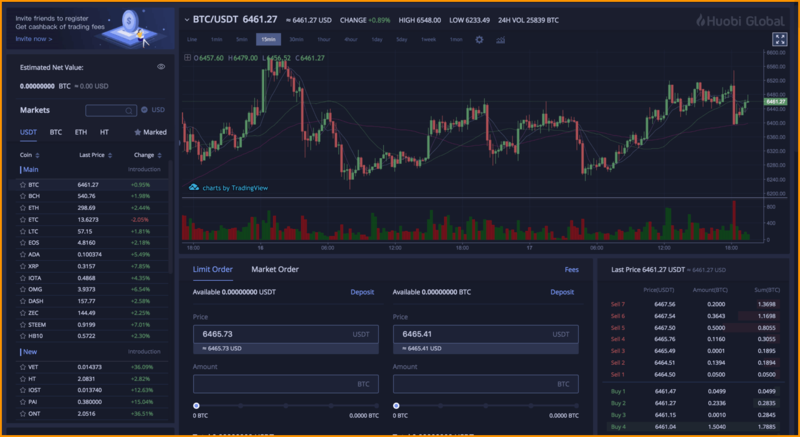 Getting started with Huobi is easy. You are required to register using your email ID and set a password. But for higher withdrawal limits, you need to submit your documents for KYC. Huobi Pro supports more than 248 cryptocurrency pairs on its platform including Ripple. Up until Binance came into existence, Bitfinex was the exchange with the highest volume. However, It is still in the top three exchanges in terms of volume. Interestingly, it is also in the top three for providing liquidity for XRP/BTC pair, which means it is an ideal place for anyone to exchange XRP for BTC. The only drawback is that it is not as swift as Changelly or Binance because their registration process and KYC verification typically take 15-20 business days. That’s why if you want to use Bitfinex, prepare well in advance. To get started on Bitfinex, you will need to register, verify your ID, and authenticate yourself for sure. The good thing is, when you get bored with the web version or want to trade on-the-go, you can use Bitfinex’s Android and iOS mobile apps to convert your BTC to XRP. 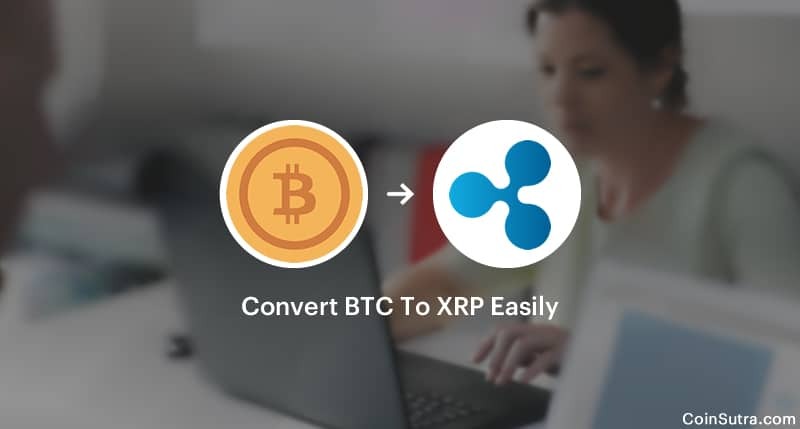 I have listed some the most efficient ways to convert BTC to XRP so you can choose the option best suited to you. A word of caution: I have seen a lot of people lose their cryptos by keeping it on exchange wallets. CoinSutra discourages this practice openly. So if are a bag-HODLer of XRP, I would recommend you get Ledger Nano S hardware wallet which will ensure that you stay in total control of your coins. Do I have to pay bitcoin conversion fee while converting BTC to any coin? Yes, you need to pay the exchange/trading fee if any specified by the exchange, which is very less usually. Thank you for this really informative piece. You are contributing a lot of good stuff to the crypto space Sudhir! I appreciate it. I also favor Binance right now. 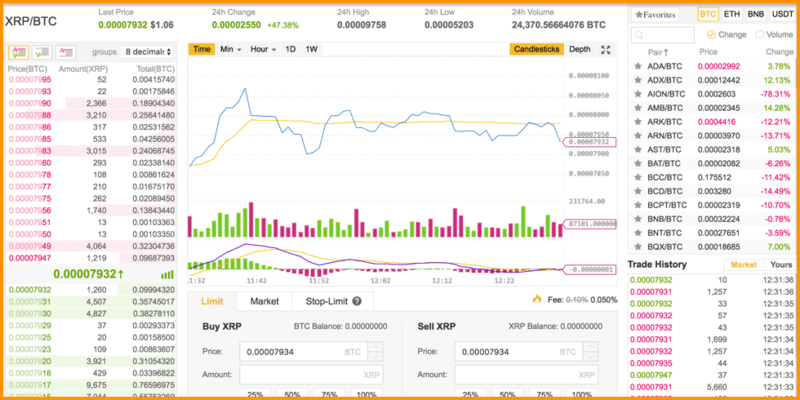 You can also trade pair ETH/XRP on Binance. So any holders of ETH, you don’t have to exchange ETH/BTC to pick up XRP 😉 Keep up the great work mate. I’m reading you!